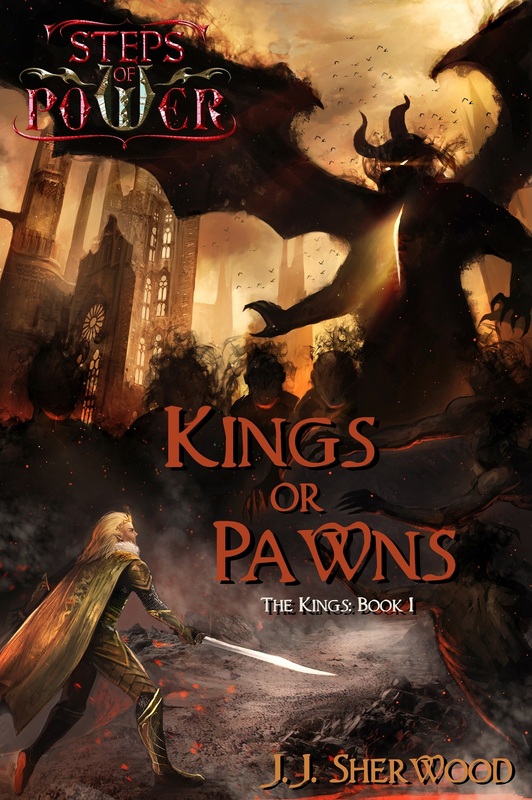 Kings or Pawns is the first novel in the Steps of Power series. It takes place after two very significant events in the world—the continental division between the human and elven races after the betrayal and death of Aersadore’s hero, Eraydon, and the recent Royal Schism that has left the elven nation’s politics even more corrupted than was prior. The new elven king, Hairem, is determined to overcome the council’s corruption and restore the elven lands, but he has far more to contend with than just the politics within the capital: an assassin has begun killing those loyal to him, a rebelling warlord threatens the city from without, and an unknown beast devastates the king’s forces at every turn. There are multiple points of view—the youthful and naïve king Hairem; the mute and spunky servant girl, Alvena; the mysterious and arrogant foreigner, Sellemar; and the cynical, dry-humored General Jikun. Seven hundred forty-five hard fought days and seven hundred forty-four miserable nights they had borne to return to this place. Now the sun that arose from the horizon was more vivid and welcoming than any sunrise Jikun had seen on any day before. The sky was golden, radiating a warmth of color that cut through the cold spring morning fog like a blade. The ancient trees that lined the wide dirt road and covered the surrounding landscape shook off little drops of water as a fragrant breeze gently wove toward the elves’ greatest city on Sevrigel: Elvorium, the seat of the Council of Elves. “That they do, Navon,” Jikun inhaled deeply. Even the stench of blood and rotting leather from one hundred fifty thousand soldiers could not conceal the pleasant aromas twisting their way toward him from across the canyon: at long last, through the final trees skirting the edge of the forest behind him, Jikun’s eyes could see the breadth of the Sel’varian city, plainly visible in the center of the cliff side that jutted out into a “V” shape over the canyon. At the end of the precipice, settled between two rivers that cascaded over the edge of the cliff, was the palace of the king. A roar of relief and excitement arose from behind the general and his captain. Several helmets dared sail past the two, ringing as they bounced off the stone bridge before them to drop like stones into the canyon below. The clamor quieted and Jikun turned back to Navon with a thin smile etched across his lips. Although it was a far cry from home, he had to admit that he too was glad to return to the capital. “Don’t make indecent threats lightly; the troops take you quite seriously,” his captain rebuked him with all the airs of a typical Sel’ven. Jikun considered it ill-suiting, as the captain had not a drop of Sel’varian blood in his body. Which was a relief for him amongst his troops. Jikun nudged his horse forward across the stone bridge that stretched over the vast ravine. The structure was a marvel of Sel’varian engineering, architecture, and magic, hardly comparable to the other elven races’ ability to design. Extending at a great expanse, the bridge was held in place by curved stone pillars mounted to the cliff side and supported by magic. The columned archway and railing across the bridge were intricately detailed, but more than being merely an adornment, they helped to shield travelers from the sudden canyon gusts that could catch a passerby off-guard. Jikun had, on more than one occasion, imagined himself lurching over the side to an inescapable death and now found himself wondering if the archway and railing had been part of the original concept, or if they had been added later after some visiting merchant had met his doom. But of course, the Sel’vi would never admit to such a design mistake. Perhaps this was why a score of houses still spotted the canyon face below the palace where they would one day, inevitably, fall away beneath the erosion of the stone and send their poor, but foolish, inhabitants several leagues downward. During which they would hopefully have sufficient time to contemplate their poor life choices. Jikun stiffened and edged his horse to the center of the bridge. This bridge, like the one on the opposite end of the canyon, led into the south and north ends of the city respectively. With the east end of the city banked by an enormous lake, the bridges were the primary entry points into the city. And all the elven magic in Aersadore could not comfort him when marching several hundred thousand bodies across its lengthy structure. The horses whinnied faintly as though sharing mutually in Jikun’s dislike for this final stretch of their journey. He reached forward, patting his mare softly on the neck. Perhaps even she recognized the sight up ahead. At the bend in the bridge just before them, he could see the city’s gateway swung open wide and hear a roar of triumph and praise erupt from the guards at their posts. The salutary trumpet blasts seemed to have already been announced and Jikun imagined the waiting elves had let them loose when the watch had first seen his army rising across the west bank’s hillsides. Jikun pulled to the center of the bridge as Navon respectfully withdrew behind him. ‘What I wouldn’t give to skip this drivel of politics and charades and take a damn hot bath,’ Jikun muttered to himself as the bridge seemed to lengthen around the bend. He glanced once over the marble side—it had been over two years since he had last seen its depths; it still made his stomach drop like a stone. Far below them was a large forest, heavily shrouded in the center by the thick rolls of mist running off from the waterfalls pouring toward a lake below. From this lake, a thin river, banked on either side by a narrow field, wound its way into the distance, away to the Noc’olari or Ruljen ethnicities in the northeast. Jikun’s head snapped back up in unease and he directed his attention instead to the first male at the gate. Jikun nodded his head once toward the guard and pressed onward, eyes sweeping the streets of Elvorium. The gold-slated rooftops glimmered in the light of dawn and the long shadows across Mehuim Way crept up the cream faces of the buildings tinted with an orange glow. All along the street sides and hanging from windows were countless elves tossing flowers, shouting praise, and glowing with smiles. Despite having been awoken before the dawn by the welcoming trumpet calls that had saluted his troops’ approach, the Sel’vi were beaming with neatly braided hair and broadening smiles, as though they had long been awaiting this day. But Jikun imagined they didn’t even remember what he was fighting for. It was simply the “victory” itself that had driven them to patriotism. The street curved gently toward the entrance of the palace. Even as Jikun was lavished with shouts of praise and welcome, it seemed but a short march down its way before he and his soldiers passed beneath a flower-laden archway and stepped into the presence of several scores of elves. Here, the mood shifted palpably. The elves waiting before the palace were taciturn and silent, bestowing no salute or praise onto the defenders of Sevrigel. Their lack of response was contagious, spreading like the Cadorian Plague through the troops and into the city beyond. Jikun’s face grew stoic, the joyous welcome forgotten. Even the naivety of praise and victory was preferred over the stiff bastards that delayed his hot bath now. These males before him were guards, council members, and a large portion of the nobility. However, despite the conspicuous splendor of the surrounding elves, the most prominent figure stood at the forefront: Hairem, Prince of Elvorium and the Sel’vi, second of non-royal blood since the Royal Schism. As the army fanned out behind Jikun, the crowd before him, with the exception of the prince, went down to one knee. This gesture was a long-established practice, and Jikun doubted that he and his army would have been shown the same respect were not the Sel’vi pedants for tradition. Pedant was, without a doubt, the most accurate and all-encompassing word he could ascribe to that breed of elves. The council members were pridefully stiff in their bows, eyes never fully lowering to the earth. Their guards, though more sincere in their respect, were nonetheless all too quick to their feet. ‘I’d like to see you leave your homes to lead a war. Then we’d see how your respect rises,’ Jikun reflected sourly in response, though his expression remained carefully detached. He was not a Sel’ven and it was perhaps this fact that led him to regard their actions with an extra tinge of cynicism. He was from the far north—the frozen lands of Darival, land of the Lithri and Darivalians. Though his army was diverse in the race of elves it had deployed, now in Elvorium he felt out of place, as his appearance clearly spoke that he was a foreigner. His hair was a blue tinted silver, like the mountains that framed Darival. His skin was a grey-white, like shadows banking the snow. And although he was tall and slender like his Sel’varian brethren, his facial features were stronger and sharper—like a sculpture chiseled from ice. Jikun knew there was one other of his kind amongst the group before him, but he could not spot the council member’s presence amongst the crowd. He wove his hand once into the air and heard his fellow riders obediently dismount to the smooth cobbled stones. He swung himself lightly from the saddle and dropped the reins at his side. There was a sudden eruption of murmuring from the council members. When he twisted from his horse to look, surprise rooted him in place. Hairem, prince of the Sel’vi, knelt on one knee before the army, his symbolic sword scraping carelessly across the ground beside him as though he was blind to all but the triumphant troops. Non-royal blood or not, the gesture caught Jikun by surprise as well. Though he had not lived amongst the Sel’vi for long, he imagined that in the history of their proud nation, no ruler had gone on bended knee before any male or female of lower rank. And for all purposes of tradition, as far as the elves were concerned, Hairem was as royal as the True Bloods of The Royal Schism three centuries before. Attesting to this were the wide-eyed council members, mouths agape between murmurs as they stared in shock toward the scandalous behavior. ‘Now what am I supposed to do?’ Jikun regarded Hairem with a knit brow and slightly parted lips, then glanced in the direction of his Helvarian captain, hoping Navon would have a notion of the most appropriate response. His captain responded with an equally bewildered look and glanced about himself, seeming to hope the answer would materialize from the crowd. Yet Navon’s eyes flicked back to the prince and he seemed to gather himself enough to move; he slowly went down to a knee before the male. In a wave, the army followed. Jikun placed a hand to his breast and bowed low, eyes never leaving Hairem. He had been on his knees for the prince’s father for two and a half years: a bow was more than sufficient. It was only when the army had returned the gesture of respect did the prince stand, raising his head sharply and drawing himself up before the army. He was young, but his blue eyes were cold and hard. His long, golden hair was loosely braided back and thin strands buffeted his face in the sharp gusts of wind coming in from the east. Raising his hands in welcome, Prince Hairem spoke formally, “Sevrigel owes you her gratitude for yet another successful war against Saebellus. Without doubt, you and your army are road weary, but I must detain you for a moment longer. Come, General, we have matters to discuss.” And with that, he turned in a sweeping motion, his golden cape billowing out and catching the wind, and stepped away to the palace beyond the crowd. Jikun heaved an inward sigh, though a report to the king was expected.‘Gods I just want a damn bath.’ He handed the reins of his horse to Navon and his captain passed him as subtle a rebuke as he could manage. Was his impatience that apparent? No, Navon just knew him too well. Jikun left his army behind as he followed Hairem through the parting cluster of council members and guards. He could see their lips move slightly as they leaned in to one another, losing no time to gossip about what had taken place. Jikun focused back ahead in time to catch the end of the prince’s cape vanishing around the corner. He quickened his pace and strode free of the crowd, mindfully aware of the seething mass of hypocritical politicians he had just stepped through. At least it was to King Liadeltris that he reported. “Keep up, General Taemrin,” the prince beckoned as he swept around another bend and stepped in through a side door of the palace. Jikun glanced once behind him and his brow knit. Was this the usual way toward the king? It had been a few years since he had set foot inside the palace. They moved down a steeply sloped, mildly ornate hallway to a large, arched doorway. Here the prince stopped, propping the door open with his foot, and leaned in toward a nearby shelf. It took Jikun a moment to gather his surroundings: soft blue light from the orb bobbing near the ceiling, gleaming rows of mildly dusty glass, wooden racks that tucked their contents snuggly in carefully carved bowels. He looked about the cellar in bewilderment. Surely the prince was not above calling upon servants to do these tasks. “Your Highness, would you like—” Jikun began. “No, almost have it,” the prince grunted. “Ah, there we go. Is Eastern Glades a satisfactory vintage? Well, I certainly hope so as it appears to be the best bottle in here.” He patted the dust from the side with a cough. Jikun held the door open as the prince tucked the bottle beneath his arm in order to pick up and examine two glasses. Appearing satisfied, he passed the Darivalian without so much as a glance and staunchly strode back up the way they had come. And further still, up a staircase divided by many levels of open rooms, all of which were empty and lit only for the sake of appearance. Here, the palace’s grandeur reached the obscene—it was as though all the gold and jewels of the kingdom had been inlaid into every facet of every surface. The highest room, and one of two private council chambers of the king, was their final destination. This room, unlike many of the others, was designed to give the appearance of a vast and heavily used study, but the dust about the room was almost tangible—as though the place had not been touched since the Royal Schism. Prince Hairem set the glasses and bottle casually in the center of the desk, striding toward the king’s chair. “Will His Majesty be joining us this morning?” Jikun inquired as he gave the lavish room a quick, distasteful glance. He heard the guards outside close the door softly behind them. Jikun’s brow knit as he eyed the wine that the prince uncorked. As though reading his mind, the prince waved a slight hand as he pulled his heavy chair back with his free hand. “I need no words of your deepest sorrows to remind me of mine. I have seen one elf die in the last century and you have undoubtedly seen the passing of thousands in the last few weeks alone. To which of us goes the greater sorrow, I have no doubt. I have had the consolation of my city. I instead offer you my deepest condolences on your recent battles.” As he waited for Jikun to sit, the general could feel the king’s eyes searching his face for emotion. “And how are your soldiers?” the king inquired, taking a glass and filling it. He leaned forward and offered it to the general. “…Thank you.” Jikun accepted it, swirling it with a gentle twist of his wrist. “My army is gratified to be serving its king,” he replied, trying to infuse some semblance of emotion into his voice. But that too had gotten lost beneath his mask. Hairem tilted his fair head back and laughed once, loudly and almost mockingly at the content of Jikun’s words. “A peace treaty? Let those that suggest it be branded as traitors. I assure you that the kingdom will never settle terms with Saebellus, General. You do not bleed in vain.” He stroked the corner of the desk, eyes hardening as though reflecting on his resolve. Jikun saw Hairem’s lips purse into a hard, thin line as his fingers interlocked, but his eyes wavered. Perhaps it was fear that moved them. “Is there anything I can offer you that my father had not already given?” Hairem spoke after a moment’s deliberation. Jikun raised his glass. “Indeed,” was the only monotonous response he could trust himself to offer. He took another sip before transitioning to the next “necessary” words in their political game. “What has taken place in the city while we were gone?” The words rolled off his tongue rather forcefully. It was difficult to put whatever bickering or vices the city suffered at any level of concern in his mind when placed in the perspective of his wars. But he nevertheless lowered his glass and met the eyes of the king with respectful attention. “Who was taken?” Jikun asked, leaning forward with unfiltered intrigue, his leather armor creaking softly in the heavy silence that had suddenly settled over the room. “All of the above,” Hairem heaved a sigh. “It is the same killer—he leaves his victims’ arms crossed across their chests, like the worshipers of Asmodius do. Perhaps they are cultist killings…” He trailed off and Jikun scoffed to himself. Cultist killings that only targeted council members? No. And he had no doubt the king knew better. Jikun hesitated. Hairem had said it had been an illness, but in light of the recent string of assassinations he was not as ready to sentence the king to such a swift and sudden conclusion. And yet he buried his suspicions and replied, “Illness. It must have come rather suddenly.” His voice was stoic, but he knew Navon could read beneath his apathy. Liadeltris had been a fierce king and opponent to Saebellus. It was common knowledge that Saebellus had been dishonorably discharged while serving as captain in the last war with the sirens, but no one knew why. Jikun had long since let the prodding curiosity subside when even Liadeltris had refused to shed light on the matter. But whatever the reason, it hardly mattered now. Saebellus had taken those loyal to him and turned on the elves’ empire. Navon gave a nod of reluctant agreement, eyes staring stoically ahead. “Something in your tone brings me to believe that I am not going to like what you are about to say…” Navon frowned, eyes flicking toward the general attentively. Navon’s eyes flashed in recognition, but the rest of his face remained apathetic. “He struck again?” He gave a heavy sigh, as though the capital should have done better to prevent such an atrocity. “No doubt the Night’s Watch will be far more numerous for some time now. It is unprecedented that an assassin has committed so many murders on high officials—within an elven capital, especially.” He paused to give a slight smile, churning out optimism from the news as he usually did. “I suppose there are some benefits to being out of the comfort of this city.” His eyes shifted across the nearest alley as he spoke, almost with a certain daring curiosity. Navon leaned forward, squinting in a reflective manner. “They are not absent from us, Jikun. And I have a story to counter your own. Years ago on my way to Sevrigel, I saw a stowaway cry out in Sel’ari’s name for protection. Everyone who tried to lay a hand on him perished in an instant. Sel’ari always has her reasons, Jikun,” Navon replied with a simple smile. “Sometimes they just do not fit into our expectations. Religion is a virtue …and one of the only reasons Sel’ari hasn’t sent this country to Ramul.” He turned toward the temple, as though his words were a monument of inspiration and the general should immediately reflect upon their wisdom. Navon gave only a dismissive wave of resigned acknowledgement. Jikun’s smirk broadened in amusement and he leaned back idly in the saddle. He watched the lean, dark male vanish through one of the double golden doors. For just a moment he glimpsed the white marble interior, gleaming from the countless candles within. And the face of Sel’ari. He felt himself recoil slightly, perhaps more out of shame than disgust. Even in the form of a statue, the goddess’ eyes were coldly perceptive, piercing through his veil of disbelief like a dagger. He nudged his horse lightly in the flank, urging it away from the doors and further along the street until he came to the shade of a low balcony. Away from the temple, he found himself once more at ease. He leaned an arm against his horse’s neck, watching the bustle of elves moving about through the sunny street. They acknowledged him with polite nods of their heads or wide smiles, but Jikun found little reason to smile in return. Why should he? What had they done today to equal his last two years of warring for their sake? Ate and danced and pleasured themselves. He knew not all males could serve in the army. And yet, that did not stop his resentment at every able bodied male he saw enjoying himself in the comfort of the city’s walls while Saebellus waged war outside. Perhaps his inner thoughts had revealed themselves on his expression as he noted several responding elves regard him with unease and confusion. He wiped his face of expression and instead let his eyes trail up along the towering buildings with their many windows, pillars, and gleaming rooftops, still further up the hill of the street and into the distance. Elvorium was not his home, but even so, it was better than any place he had been since he had left Darival. Except, perhaps, for the whore houses of Roshenhyde. “That was pleasant to see her again,” Navon’s voice came from behind him. Jikun straightened and turned, eyeing the peaceful smile stamped across his captain’s lips. He tossed him the reins, watching Navon leap with some faint form of grace onto his horse.